The goal of this course is to present an overview of the broadcast industry with plenty of hands-on projects. Students should gain confidence and understanding in a variety of communication situations and gain important media literacy skills. This is a one-semester electronic technology , journalism, and laboratory course. Major units we will study include the following: iPad/iMovie Digital Storytelling, Television Studio Production Techniques, Copyright laws, Digital Camera Operation, Basics of Final Cut Pro X Editing, Broadcast Scripting, Journalistic Styles, and Specialized Stories: Mobile Journalism, News, Features, Sports, etc. Students learn pre-production, production, and post-production techniques and protocol. Students’ work will be published to the Internet. Learn more about all of our student media by visiting our PROGRAMMING page and subpages. In this INDEPENDENT course, with the main objective to produce LADUE VIEW, LADUE SCHOOLS TODAY, and iAM LADUE. In this class, students have the opportunity to further develop their skills with broadcast technology, journalism, video production, mobile journalism, live productions, short filmmaking, digital storytelling and media literacy. Students will also have opportunities to attend national journalism conventions, as well as work as media production teams for professional organizations. The course requirements are structured to meet with individual class preferences whenever possible. Students work both individually and as a team to produce a variety of projects. All three phases of production work will be HEAVILY emphasized! Projects include: iPad Mobile Journalism, Multimedia Journalism, Online Digital Portfolio's, Public Service Announcements, various Ladue School District projects, short film and feature stories for the monthly cable news magazine show “Ladue View," and monthly projects for HEC-TV (Higher Education Cable) online and on iTunes. Students are also asked to assist with live shoots in the VTC or other possible professional shoots with Mr. Goble. Students’ work will be published to the Internet. Intro to Media (9,10,11,12) is a semester course designed for students who wish to learn modern research, reporting, and publishing skills that are essential to understanding information from multiple platforms. Students will learn appropriate news values, social media, photojournalism, podcasting, and mobile video production. Students will discuss and explore current trends of news and create their own content in order to become innovators of their own media. Students will write, direct, shoot, and edit sports multimedia videos to play on the Ladue athletic scoreboard during selected athletic events and games. Students will cover the fundamentals of sports multimedia content, camera shooting, sound, lighting, graphics, and editing, among other production skills. Students will work independently and in sports production teams to create multimedia content. Student’s will work in Ladue's fully-equipped, state-of-the-art Video Technology Center and shoot on location on Ladue’s campus using HD digital camcorders and mobile devices. Students will edit digitally with iMovie and Final Cut Pro X. After successfully completing this course, students may move on to the advanced levels, or choose to follow a television or film pathway in Broadcast Technology II. Students in this sports production class will be invited to become a part of the Scoreboard Operations staff, which are paid positions by the district to work athletic events and/or games after school and on weekends. Students develop an understanding of visual sports storytelling and craft compelling sports stories using video and sound. Students will be able to identify and execute proper pre-production, production, and post-production methods for sports multimedia productions. Students will be proficient in the technical and professional interpersonal skills needed for professional multimedia productions. Students will have an understanding, and hands-on experience, of creating, filming, managing, editing, distributing, and archiving sports multimedia productions. The class will be offered in the Fall and Spring Semesters each year. There is no prerequisite for Multimedia Sports Production I. The class will be offered to any and all students grades 9-12. 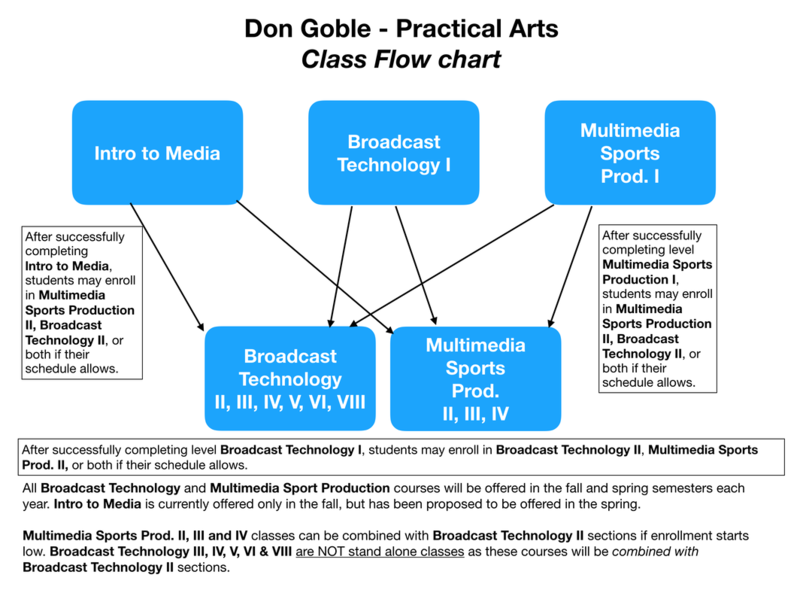 All levels of Multimedia Sports Production (I, II, III, IV) could be combined with Broadcast Technology II (III, IV, V, etc) if there isn’t a high enough enrollment for a stand-alone class in Multimedia Sports Production or Broadcast Technology II. Example YouTube playlist of videos we will create in this class. Feature video on HEC-TV's "Behind the Minds"